Could my newborn have a clogged tear duct? Q: One of my newborn's eyes is continually running. Could she have a clogged tear duct? A: She could. 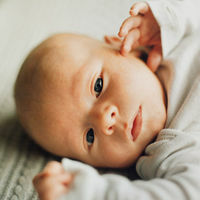 Clogged tear ducts, or nasolacrimal duct obstructions, are very common during the first year of life—so common, in fact, that I see dozens of babies with perpetually runny eyes. These obstructions are almost always perfectly harmless and nothing to worry about, even though the resultant tears may give you pause. The drainage of tears is a bit of a design flaw in babies: Tears are formed by multiple ducts but drain through only one tiny opening in the corner of the eye. This drainage duct, next to the nose, is sometimes covered by a thin membrane that doesn't break open after birth, causing tears to overflow from the eyes. It can also get blocked pretty easily by the eyes' natural fluids. This condition usually clears up on its own by the first birthday as the ducts lengthen and widen. In the meantime, I recommend flushing the eye with the best and most sterile eye drop of all: breast milk. (I look to this fluid as a cure-all for everything from runny eyes and noses to minor rashes —and everything in between.) Some doctors think that saline solution and antibiotic eye drops are better than breast milk, but I disagree. I also recommend gentle circular massage of the tear duct at the junction of the eye and the nasal bridge several times a day—at least 10, if you can swing it. If the eye is swollen or inflamed, or if the discharge is getting thicker and more copious, call your doctor. Rarely, these duct obstructions need to be treated by an ophthalmologist, who can perform a simple "probing" procedure under a light general anesthesia. I see babies who need this surgery very infrequently.